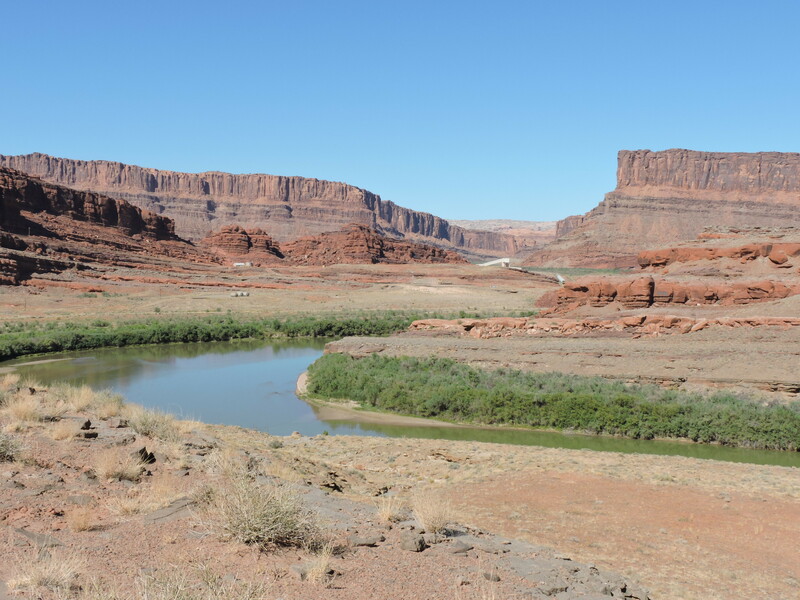 We took boats twice on the Colorado River south of Moab to the edge of Canyonlands National Park. We wanted to do it again. But Colorado and Utah had been in a prolonged drought, and the river was too low for jet boats. Gravity would get Alie into a raft, but with her RA, only hydraulics could get her out. So we drove Utah 279 along the western side of the river [the north side where it loops]. It is paved to just beyond a Texas Gulf potash plant near the base of Dead Horse Mesa. A dirt road continues into Canyonlands. Click on photos to enlarge and use the back arrow to return to the post. First American rock art dates back as much as 8 thousand years; this is likely of the Fremont period just 1 to 2 thousand years old. 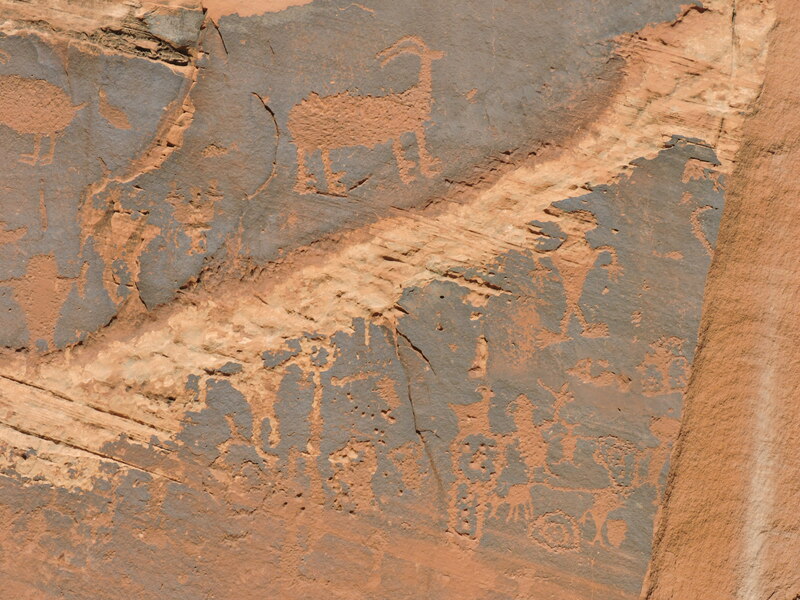 First American rock art carved into the desert varnish thousands of years ago is next to the highway. I wondered how the artists got up that high to work. Then it occurred to me ground level was once probably quite a bit higher before it was dug out by the relentless river. We passed a campground. There are also a number of BLM maintained trails along the way. My favorite name was “Poison Spider,” but I chose to walk the Corona Arch trail. It crossed a railroad track that seemed still in use. We saw a train coming from the potash plant later on when we drove further down the road. 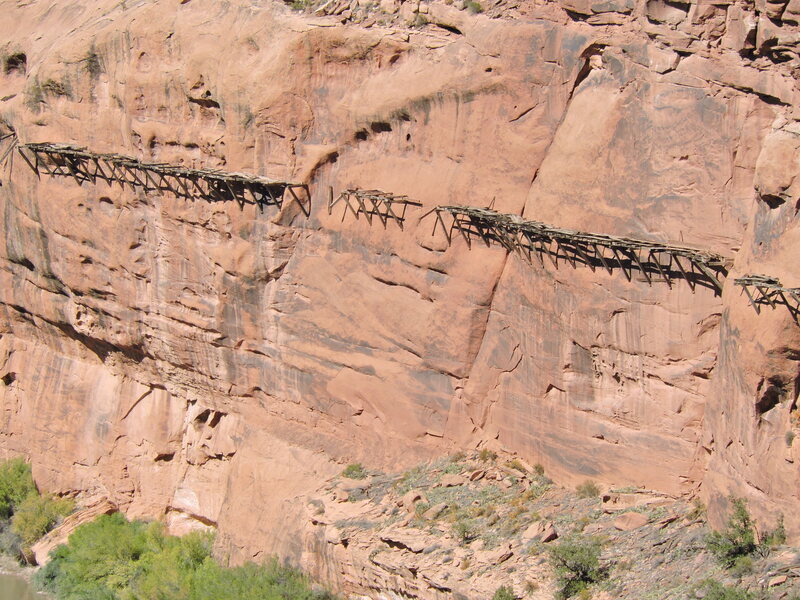 The Corona Arch trail crossed this track. UT 279 ‘s Wall Street Climbing Area attracts many rock climbers. What do I grab now? Time to get new tires or turn around. I would like to have driven the dirt road to the western Canyonlands National Park visitors center, but it became increasingly rough the further we proceeded. Finally I turned around. I was confident in my vehicle, but I wasn’t confident in my tires. They still had good tread but already more than fifty thousand miles on them. I had a spare, but two flats would have left us stranded. Friends have a sign in their kitchen that reads “A bad day in mountains is still a good day.” It came to mind in Durango, Colorado. 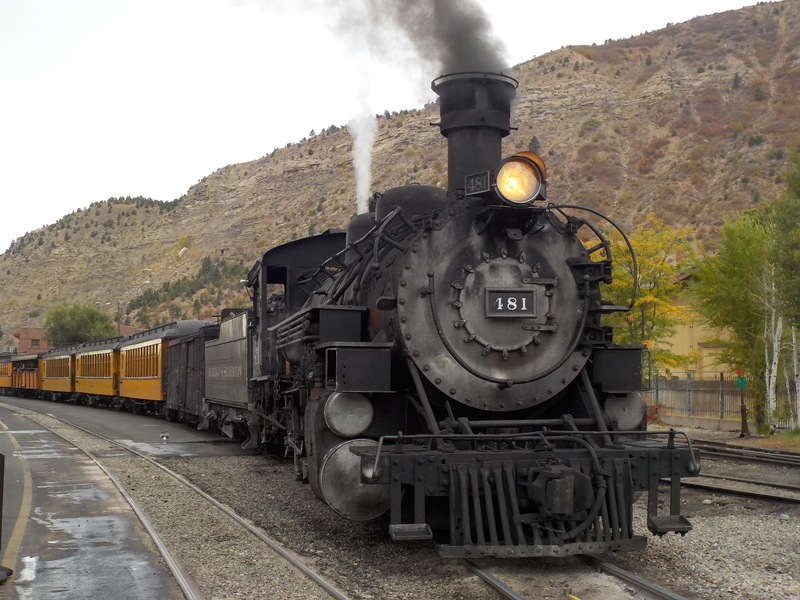 Alie was ill and could not go with me on the Durango & Silverton Narrow Gauge Railroad. Her ticket was non-refundable. It was overcast all day with rain off and on. I was sitting in a open-sided rail car with occasional soot from the locomotive blowing into my eyes. It was still a good day. The Denver and Rio Grande Railroad founded Durango in 1879 and completed a line to the 1874 mining town of Silverton in 1882. The narrow gauge railway began hauling passengers and freight and has been in continuous operation for 137 years. 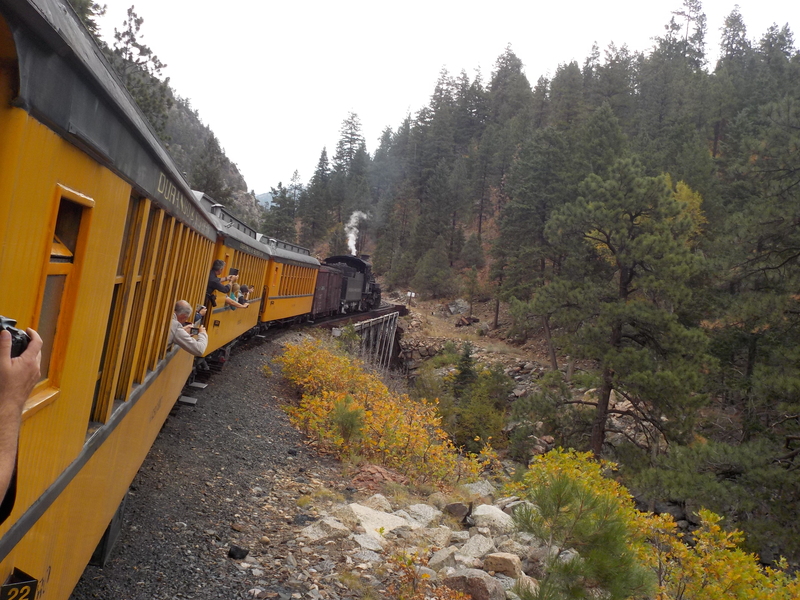 Today, tourists keep the railroad alive as they ride along the side of the narrow Animas River canyon pulled by a coal-burning locomotive. It may have been a questionable decision on a cool day with rain showers, but I chose an open air car because the seats face out, and there are no obstructions to the views. My companions in the adjoining seats were a pleasant young couple and their children who grew up in a nearby town but were now living in Texas. In 2009, I had a great bowl of soup and piece of pie at Silverton’s Brown Bear Restaurant. Both the soup and pie were still wonderful, and my waitress had the same name as Alie and had lived for many years in our Florida hometown. Trackbed had to be cut into the rock at places. I recommended the Brown Bear to the Texas couple. They seemed to like it. Seeing me there, they introduced me to his parents who were picking them up in Silverton. As fewer people made the round-trip, the conductor had plenty of time for conversation on the way back to Durango. So did two men from Fort Lewis College who had been fishing in the mountains. They shared a wealth of information about the area. Carved by the Gunnison River in Western Colorado, the Black Canyon is just 40 feet wide at its narrowest point. Its walls vary in height from just over 1800 feet to over 2700 feet. It is not the deepest canyon in the U.S. [Hells Canyon in Idaho] nor the most dramatic [Grand Canyon], but its Painted Wall is the highest cliff in Colorado, and in a part of the country where rock is often red, its dark walls are striking. Once again, we came upon the power of one person [or perhaps a few] to make a difference to a community. We had seen it at the Hubble Trading Post where Hubble made a difference to the local Navajos, in Lake Placid, Florida, in Helen, Georgia last summer, in Casey, Illinois and in the Wisconsin Dells in the fall. Then in September, we drove through the Colorado National Monument just outside Grand Junction. The town of Fruita lies in the distance. 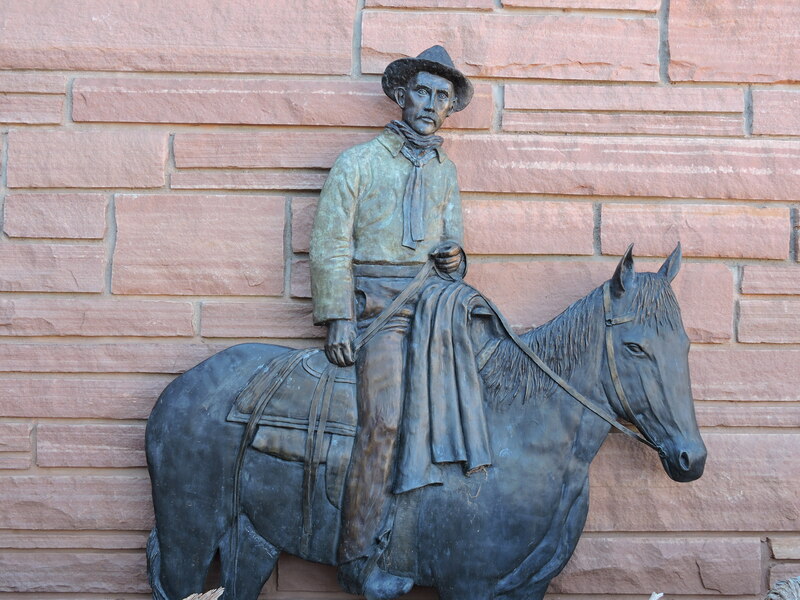 John Otto lived alone in the canyons and on the plateau southwest of Grand Junction, Colorado at the end of the 19th century. He was married briefly, but his wife couldn’t take the isolation and his eccentricities. 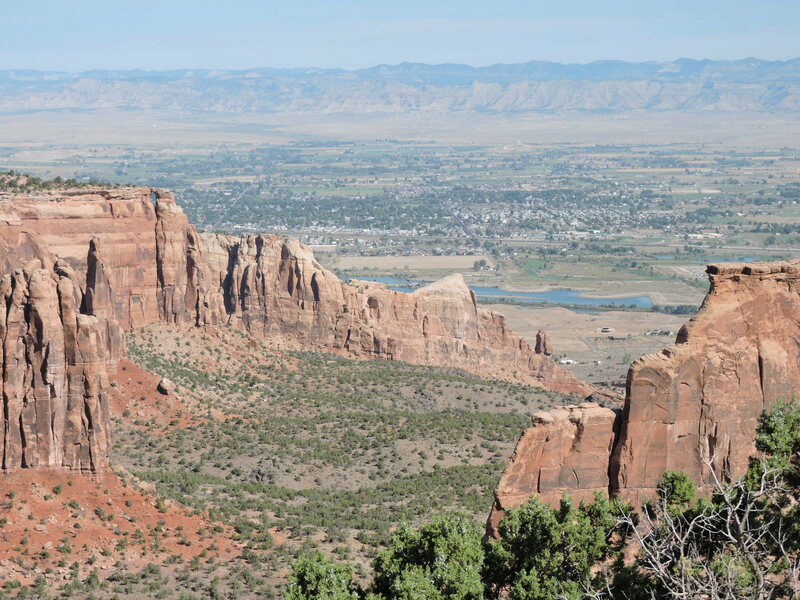 As tectonic plates pushed together millions of years ago creating the Rocky Mountains, the Uncompahgre Plateau rose over 2000 feet above the Colorado River. Then over millennia, water flowing off the plateau carved canyons leaving scattered columns here and there. John Otto loved the place so much, he encouraged everyone in the area to lobby Congress to make it a National Park. He worked tirelessly without pay, not only pushing the idea but cutting trails through the area so that others could enjoy it too. The efforts of Otto and those he convinced, resulted in the creation of the 32-square mile Colorado National Monument in 1911. Otto was named the park’s caretaker and held the job until 1927 at the grand salary of one dollar per month. Ancient Utah junipers seem to grow out of the rock. John Otto initiated the tradition of raising the flag on the tower to the right, evey July 4. There are several tunnels along Rim Rock Drive. 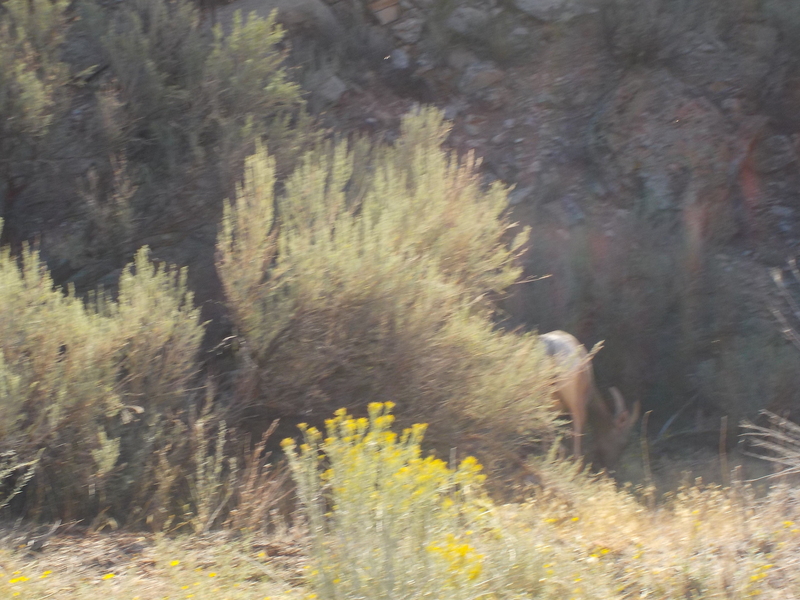 The only species we saw of the many animals in the park was the desert bighorn sheep. We captured a picture of some butts disappearing into the brush. But just seeing the vistas was worth driving the 23-mile long Rim Rock Drive. There are campgrounds for those who wish to stay longer and 45 miles of trails ranging from one just a quarter mile long to the eight and a half mile-long trail into the the No Thoroughfare Canyon. We think Colorado has so many spectacular drives that if they marked them all “scenic,” the entire state map would be dotted roads. 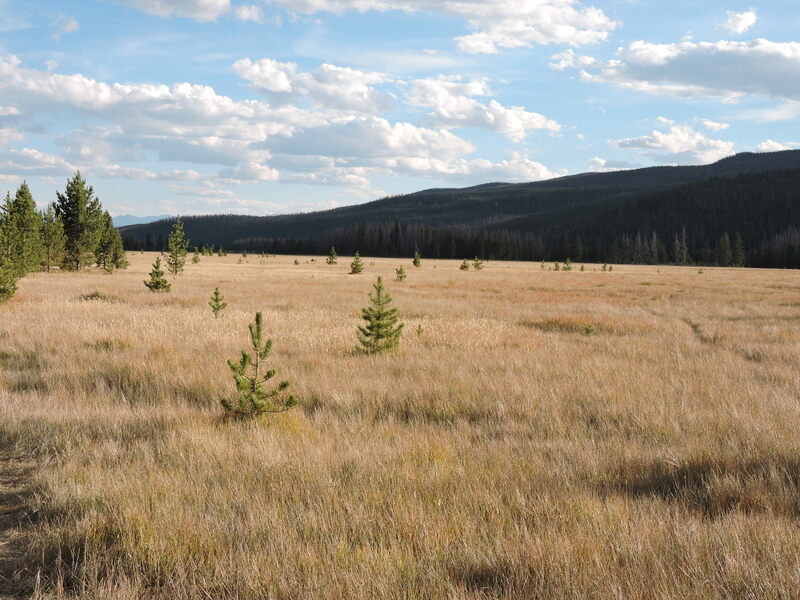 Perhaps, Colorado’s 131, 133 and 134 are only scenic in the fall. 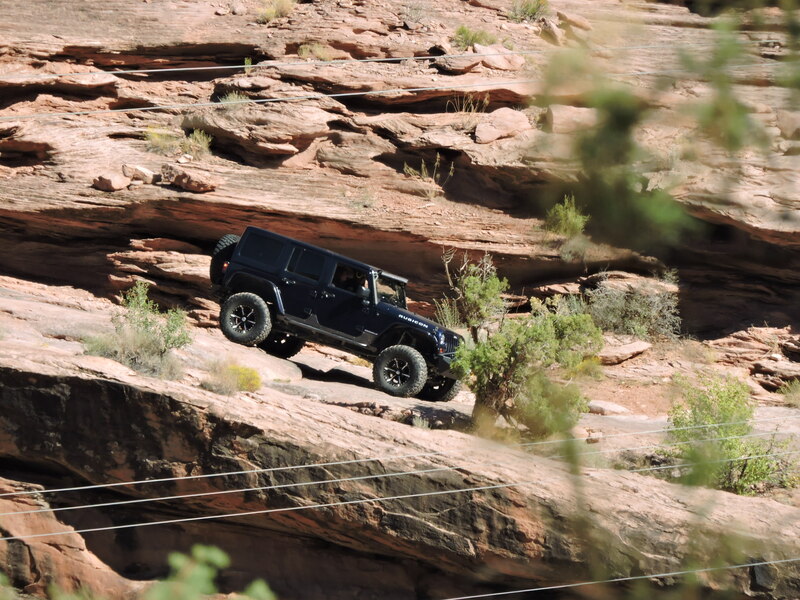 In Montrose, Alie noticed roads mostly marked scenic that would take us on an loop close to the Utah border and Moab. We went south on U.S. 550, west on Colorado 62, and north on Colorado 145 along the San Miguel River through Norwood where we picked up Colorado 141 and the Delores River outside Naturita which we took past Gateway and back east to U.S. 50 north of Montrose. From Placerville on, the 133 mile-long stretch is called the Unaweep-Tabequache Scenic and Historic Byway. In Norwood, I stopped to take a picture and talked for a while with the Fire Chief, a retired fireman from Chicago. His assistant had lived in Norwood all his life. He said the drought was the worst he had ever seen. Norwood, Retired Chicago fireman, now Chief of the Fire Department and an aid prepare for the annual fundraiser. 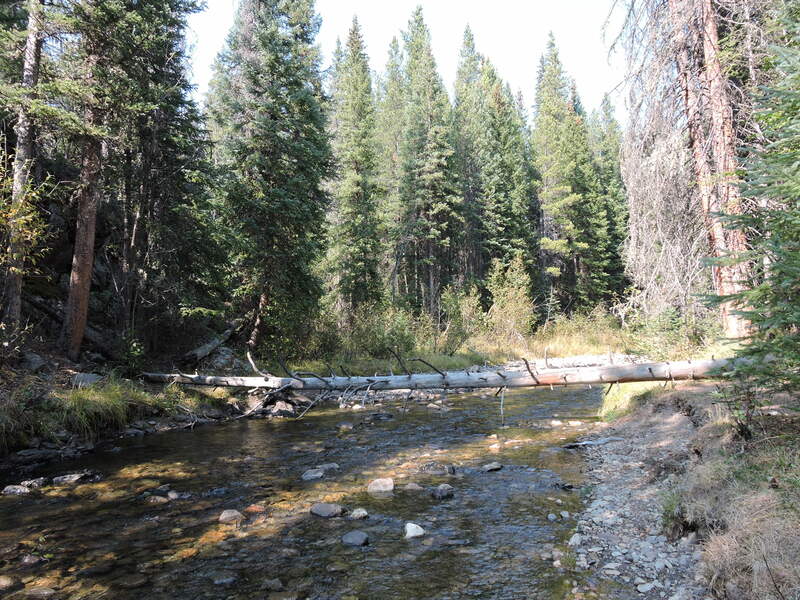 Further up the road, we came to remains of 13 mile-long wooden flume hanging on the side of the Delores River Canyon. Built in 1891, it carried 13.46 million gallons of water per day to placer mining operations. We enjoyed the drive so much, we we drove portions again later in our trip when we returned to Colorado from Utah. Click on photos to enlarge; back-click to return to the post . Alie enjoys a walk in the woods. That is our term for any time away from crowds in a natural setting, be it a forest, a meadow or even a beach. Getting away from people our first day in Rocky Mountain National Park was a challenge because entrance was free. Subsequent days were just busy. We spent almost all of our time in the Kawuneeche Valley on the west side of the mountains. 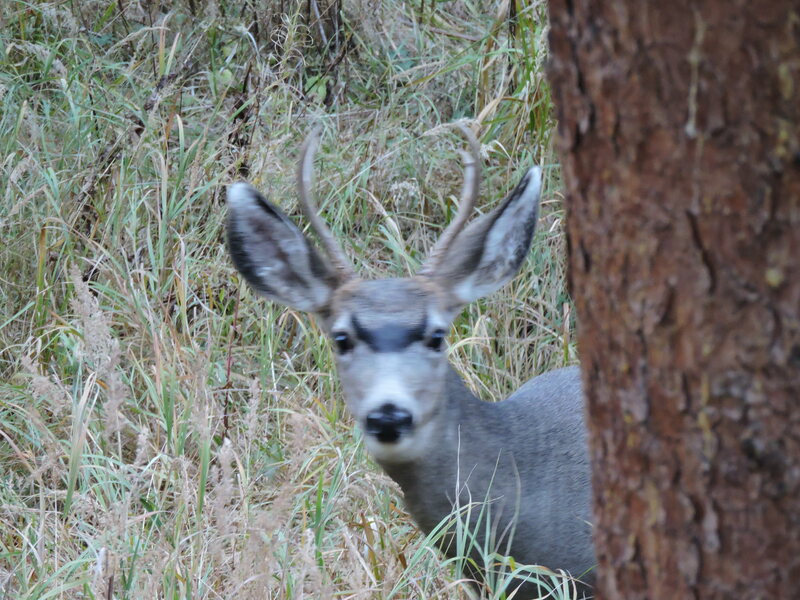 I doubt any quiet time by ourselves could be found on the east side near Estes Park. We stopped at the Colorado River Trailhead. We weren’t able to hike to Red Mountain, Lulu City or the Little Yellowstone. So not far up the way, we left the main trail and found our way down to the river. We were alone; it was quiet; it was beautiful; and it was nothing like the Colorado River further downstream. We could have waded across it or walked across a fallen pine. Then relatively late in the day, we were alone most of the time walking the Coyote Valley trail. Most of it was through meadows fringed by the river and some trees. Alie’s rheumatoid arthritis prevents her from walking long distances or on rough trails, but she was content to read one day while I walked the Green Mountain trail to Big Meadows. There were others on the trail, but I move slowly and was in no hurry, so most of the time I was alone. I did meet one young woman traveling alone who said she was frightened when she encountered a moose near Granite Falls. I did not want to go that far to see if I could find it. Our motel was outside the park in Fraser where I took an early morning walk along the Fraser River and saw more mule deer and a beaver dam. “A walk in the woods” is a meditation; it sharpens awareness of small pleasures; it quiets the mind; the environment and every living thing become your companions. U.S. 34 through Rocky Mountain Park takes one over the highest point on any U.S. highway, 12,183 feet [3713 meters]. I drove it in June 1964. I don’t have great pictures from that drive, but I have great memories of snow capped mountains – which probably improved in my memory as the years passed. I wanted Alie to see it. But when we drove that way together, the road was still closed by snow. We finally made it in September 2018. At that point, there was no snow. By coincidence, it was “National Public Lands Day,” and all U.S. parks were free, so it was crowded. As is often the case with old memories, the drive was not as good as I hoped. 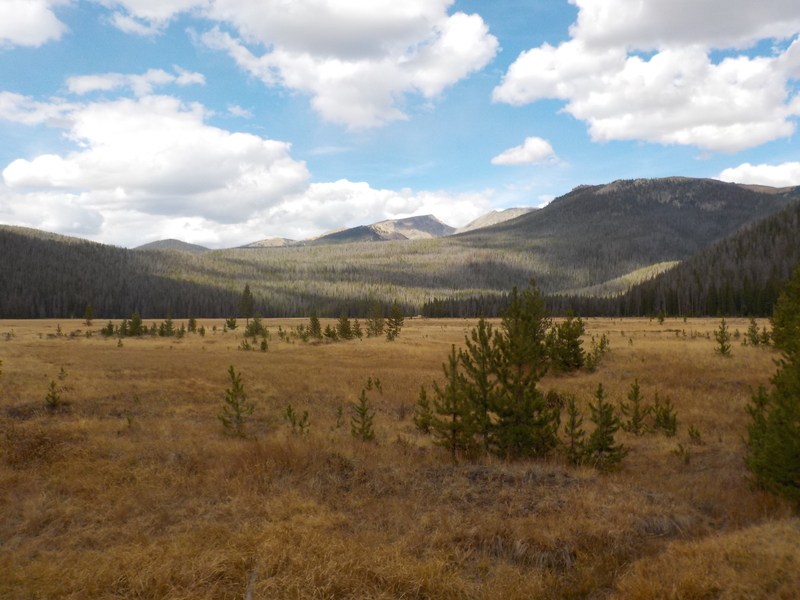 But it was lovely, gave us a good orientation to the West side of the park, and we enjoyed the next couple of days seeing the fall colors, hiking and looking at the animals. Click on photos to enlarge; use the back arrow to get back to the post.